Few things are as rewarding as a good mountain bike ride. The only thing that could possibly make the experience even better is sharing it with someone else. It’s in that spirit of the shared adventure that local mountain bikers come together a couple of times a week from May through early November as conditions allow. The rides are low key affairs, organized by local bike shops to spread the joy of riding and give recreational riders a good reason to get in the saddle for a couple of hours. Neither races nor fundraisers, there’s no sign up or fee required and everyone is invited and encouraged to join in. Every Tuesday at 5PM, a dozen riders carpool from Omer & Bob’s shop in downtown Lebanon to trails in Lebanon, Cornish, Claremont, Newport, or beyond. 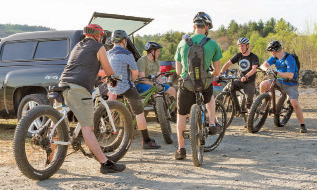 One of the shop’s team of accomplished riders always leads the ride, and Jonathan Wilmot, who organizes the rides, says they’re intended to encourage people to get out on their bikes and to help riders discover and explore the trails of the Upper Valley with a knowledgeable guide. Many of the participants are regulars, says Jonathan, others may be visitors from out of town or curious newcomers looking for something new to try. The two-hour ride is at a fairly mellow pace, and nobody will be dropped from the group – but trails are trails, notes Jonathan, and some level of fitness and comfort with riding will be required. 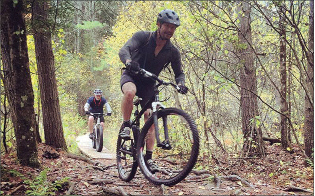 Tuesdays and Thursdays at 6pm, Mason Racing (located on Mechanic Street just west of the Green), hosts group rides in the Boston Lot, starting from the Nature Walk trailhead off Pine Tree Cemetery Road. The 1500+ acres between Rt. 120, Rt. 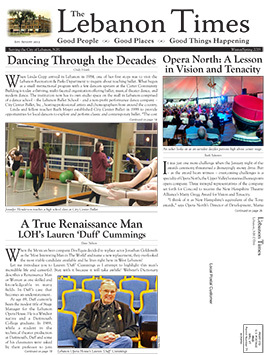 10 and the interstate comprises land owned by the town of Lebanon and Dartmouth College. After turbulent years with the trails in limbo, the Upper Valley Mountain Bike Association (UVMBA) is now the designated steward of miles of “official” multi-use trails in the B-Lot, as it’s also known. One beautiful spring evening the trailhead is a buzz of activity with riders busy pulling bikes off racks and donning helmets. Some have come with regular mountain bikes, others with the newer breed of “fat bikes” with massive 4” wide tires. The riders themselves come in all shapes, sizes and abilities, and as one early arrival waits for the rest of the group to get organized, he explains that these group rides are great opportunities to meet other riders of different abilities and to challenge oneself in good company. Boston Lot, Lebanon and Hanover, NH – primary access and parking at the Nature Walk trailhead off Pine Tree Cemetery Road (south), the DHMC trailhead on the Hitchcock Loop Road (east), and the Wilder Dam picnic area (west). The organizers of the group rides and the UVMBA encourages all riders to take part in the trail maintenance days that help keep the network at Boston Lot in good shape. The next one takes place on June 6. For information about trails, group rides and maintenance work, head on over to the Upper Valley Mountain Bike Association’s website at www.UVMBA.com. Jason Ouelette from Mason Racing, who organizes the rides and is an avid participant, says that a typical summer ride may have a turnout of 25 riders or more. They’ll usually split into a handful of self-selected groups of riders of similar abilities or ambition, who will then stick together for the evening on the trails. Some may do a leisurely 5-6 miles on the easier stuff, others 15 miles or more on all of the varied terrain that Boston Lot has to offer. Most groups will ride for a couple of hours, finishing around dark. While some riders have made it a tradition to head to Salt hill Pub to celebrate their accomplishments and the afterglow of a good ride, others are content with the ride itself. You can certainly ride trails on your own, and many appreciate the solitude. But there’s much to be said for the support and encouragement from a friendly group of peers, and they may show you trails you didn’t know existed, or motivate you to ride more often than you otherwise would.